There were two causes for excitement in Room 1534: the premiere of the Stenheim Alumine Three ($29,900/pair), the Swiss company’s newest three-way floorstander, and the return of Einstein Audio to the US. The latter comes courtesy of its new brand ambassador, Walter Swanbon of Fidelis AV. The sound wasn’t perfect—it was a little peaky on what may have been an unnaturally bright Deutsche Grammophon LP of Geza Anda playing Mozart’s Piano Concerto No.17, but it was still wonderful (and, sadly, the only Mozart I heard at the show). That a totally different, winningly smooth sound came from Intervention Records’ reissue of the LP Joe Jackson Live in New York suggests that an LP of someone else playing Mozart’s PC No.17 might have been a better choice sonically. 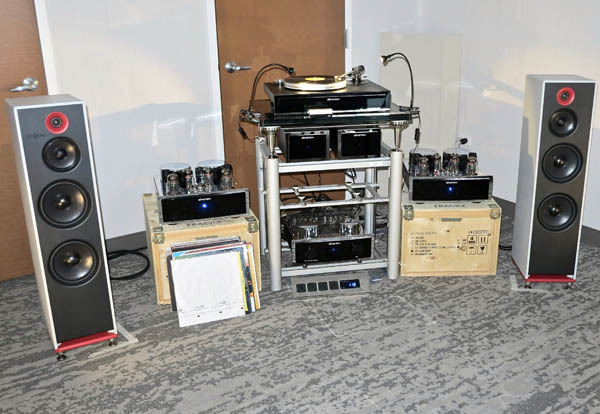 The Einstein pieces, supplied by Danny Kaey, were many: Silver Bullet OTL monoblocks ($68,000/pair), The Preamp ($23,900), The Phono monoblock phono preamp ($16,900), The Arm ($7900), The Turntable ($12,000), The Cartridge ($7900), The Line Strip/Filter ($3300), The Integrated Amp ($22,000), The Power Amp (hybrid—$20,000), and The Tune Integrated Amp ($9000)—although I’m certain not all of these were in use during my visit.